I was pleasantly surprised with how it turned out. For a first attempt it wasn’t too bad. There was no soggy bottom (phew!) but I did struggle with rolling out the pastry after it had chilled in the fridge so ended up with quite a thick layer of pastry and a little bit of a patchwork effect! In the future, I will try to make sure my pastry is a little thinner but also try to remember that my tart tin has a removable base as when I was taking the pastry out of the oven after blind baking it I managed to remove the base leaving myself in quite a pickle! 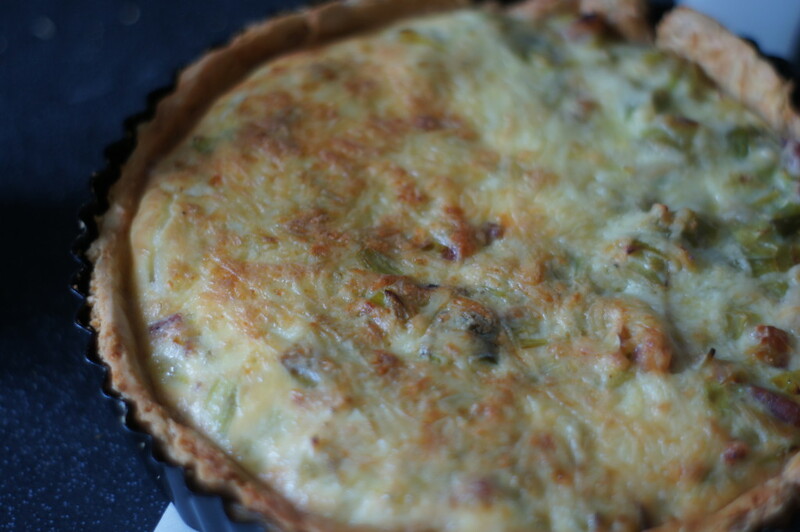 You will need a 23cm loose-bottomed tart tin and some baking beans. If you don’t have any you can use anything that is dry that will spread out to fill the space like rice or beans. You do need to make sure you have enough time as this is quite time intensive. Make sure you allow yourself 3-4 hours before serving up as with resting the pastry, blind baking and preparing the filling it will keep you busy! 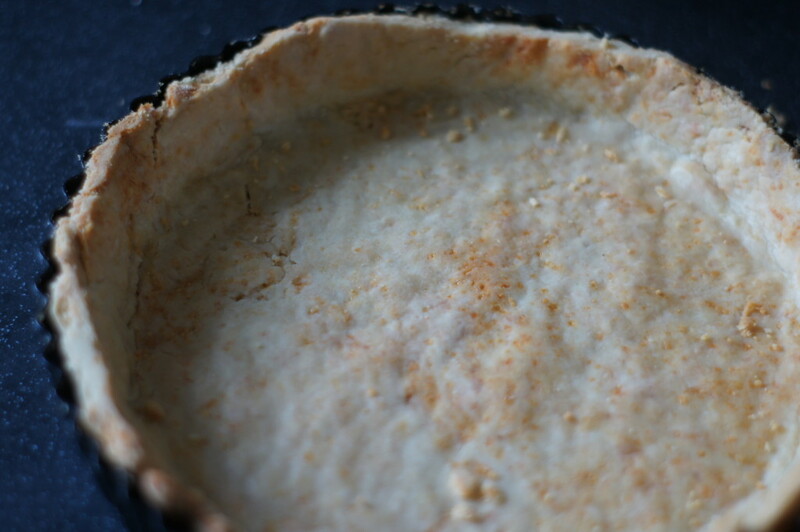 1) Grease a 23cm loose-bottomed tart tin. 2) For the pastry, sift the flour into a bowl, then add the softened butter, parmesan and a pinch of salt (I forgot to add the paremesan to begin with so had to add it in at the end). Gently rub the butter into the dry ingredients using your fingertips until the mixture resembles fine breadcrumbs. Mix in the egg yolk and add a tablespoon or two of cold water to bring the dough together (You might need more or less water depending on your flour – I found I needed 4 tablespoons to bring mine altogether). Form the dough into a ball then flatten into a disc and wrap in cling film. Refrigerate for two hours. 3) Roll out the pastry on a lightly floured work surface to make a circle large enough to fit over the tart tin and approximately the thickness of a pound coin. 4) Use your rolling pin (it is easier to almost wrap the pastry around your rolling pin and them unroll it over the tin) to lift the pastry into the tin and gently push the pastry into the base of the tin, pushing it right into the edges. Prick the base with a fork (I forgot to do this – oops!). Leave the pastry overhanging the edge of the tin, but trim any excess pastry that hangs down far enough to touch the work surface (as this will burn when cooked). Line the base of the pastry with baking parchment and fill with baking beans. Transfer to the fridge to rest for 15-20 minutes. 5) Preheat the oven to 180C/350C/Gas 4. For the filling, drizzle the bulb of garlic with a little olive oil and wrap in foil. 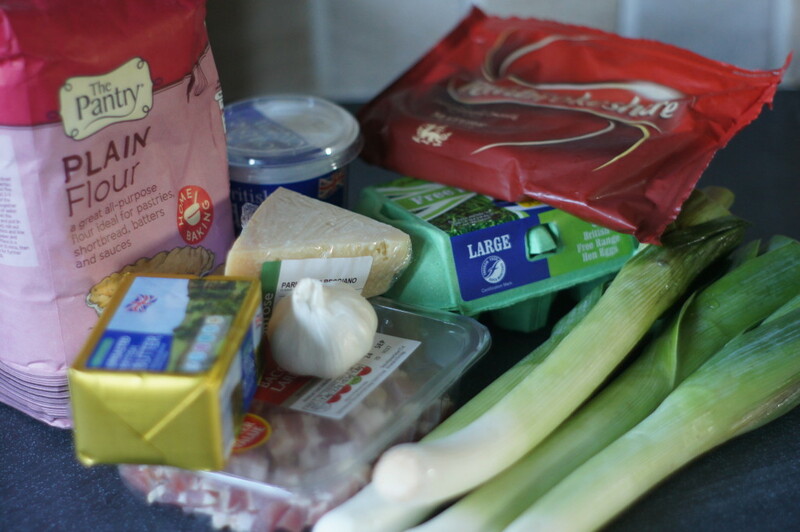 6) Remove the tart tin from the fridge and blind bake for 20 minutes, with the garlic alongside. 7) Remove the pastry and take out the parchment paper and baking beans. If necessary, return it to the oven for a further five minutes to cook the bottom of the pastry base. Leave the pastry to cool for five minutes then brush with the reserved egg white. Return to the oven for five minutes, or until the pastry is a light golden-brown colour. Remove the pastry and garlic from the oven and leave to cool. Trim off any excess pastry from the edges with a sharp knife. 8) Heat a tablespoon of olive oil in a large frying pan. 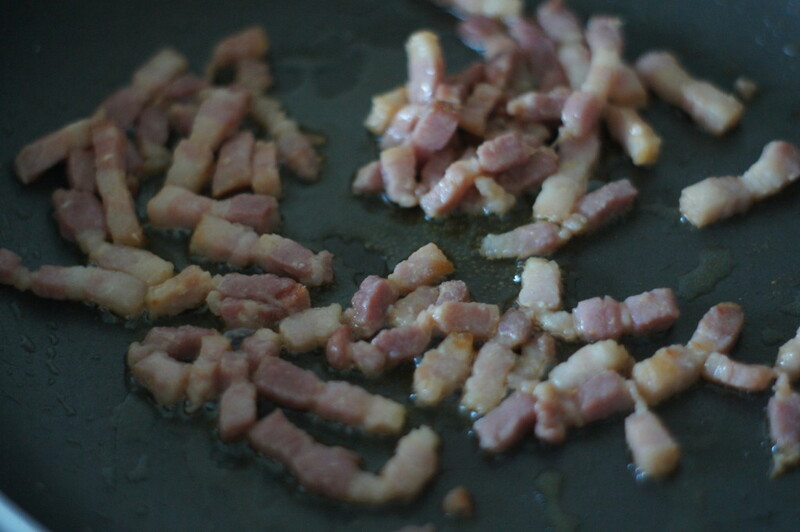 Add the bacon lardons and fry gently for 5-6 minutes until golden-brown. Add the leeks to the pan and cook gently for 15 minutes, stirring occasionally, until softened and starting to caramelise. Season with freshly ground black pepper. 9) Reduce the oven temperature to 160C/325F/Gas 3. Squeeze the roasted garlic cloves from their skin and mix into the leek mixture. 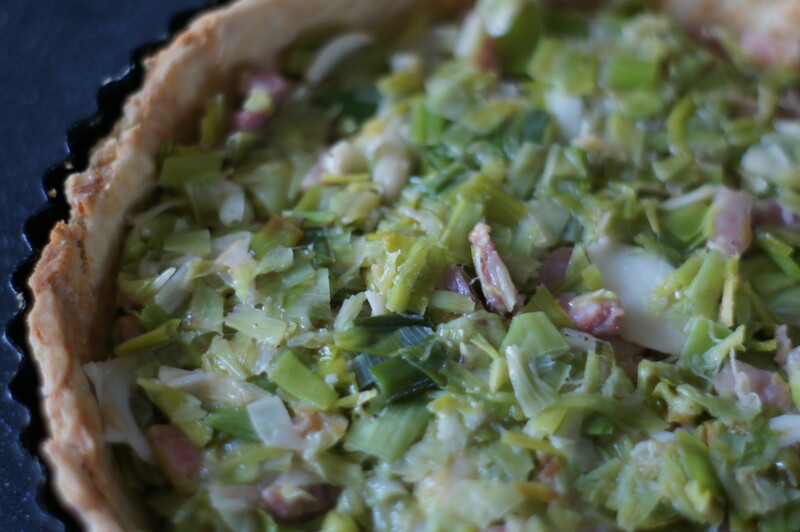 10) Spoon the leek mixture over the bottom of the pastry case. 11) Mix the eggs, cream and a pinch of salt and pepper together in a bowl and whisk to combine. Pour into the pastry case and sprinkle over the grated cheese. 12) Bake in the oven for 25-30 minutes, or until the filling is just set. Leave to cool for a few minutes then cut into wedges and serve.